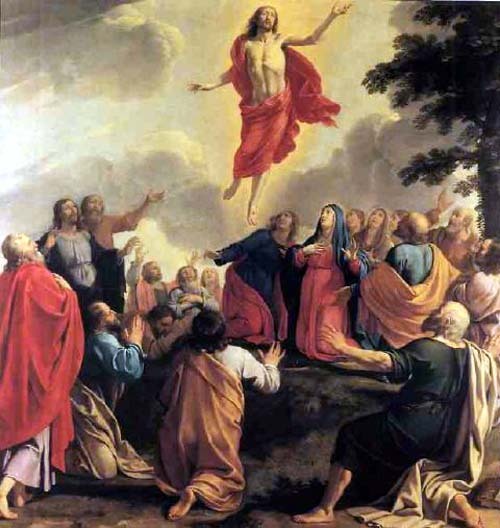 This Sunday is the Sunday after the Ascension. In the period from the Ascension to Pentecost, we meditate on the glory of Our Lord's Ascension, but we also prepare ourselves for the descent of the Holy Spirit at Pentecost. The propers for this Sunday indicate this duality (which are the same in the Ordinary and Extraordinary Forms). Ant. Hear, O Lord, my voice, with which I cried to Thee, alleluia: my heart has said to Thee: I have sought Thy face, O Lord - Thy face which I shall seek: do not turn Thy face away from me, alleluia, alleluia. V. The Lord is my light and my salvation: whom shall I fear? Ant. Father, while I was with them, I kept them whom Thou gavest Me, alleluia: but now I come to Thee: I pray not that Thou shouldst take them out of the world, but that Thou shouldst keep them from evil, alleluia, alleluia.